This photo from early in 1970 shows R.D. 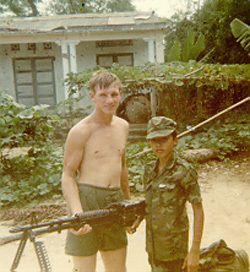 “Erp” Erpelding of Fort Wayne, Ind., holding an M-60, and our interpreter “Balls” (Duong Van Dien). Balls is wearing the utilities we had cut down for him, with the small metal CAP badge on the left pocket. This photo was taken in our main village and you can see one of the more prosperous houses in the background, though splattered with bullet holes and shrapnel damage.